Orcinus Orca. Doesn’t that name just scream terror, horror, and everything else that makes your blood run cold? What, no? Really? Why not? It’s a KILLER whale! Maybe it’s because we’re just used to images of tamed versions of these whales doing tricks at Sea World, which we would never expect out of a carcharodon carcharias. Maybe, because they’re air-breathing mammals like us, we can’t conceive of them performing acts of cruelty, like a carcharodon carcharias. Maybe it’s because some of us mistakenly think they’re just too cute to be evil, unlike the carcharodon carcharias. Or maybe you saw this film that took the leather-jacket-wearing cool out of killer whales forever. We have the insanity of Italian super-producer Dino de Laurentiis to thank for this celluloid headache. Apparently, after watching Jaws - which he must have thought was a minor indie film that no one would recognize or interpret as having been copied - he ordered his producer “by the bones of Amen-Kara, and the many moons of Jupiter to find a fish tougher and more terrible than the great white!” Orca was born. From here on, it’s your standard revenge between a bully and the reluctant challenger being pulled into a main event showdown. 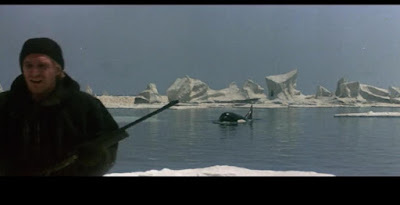 In rapid order, the whale destroys some boats, breaks vital fuel lines, sinks Quody’s dockside home, bites off Bo Derek’s leg (that TERRIBLE fiend! ), and performs leaps. Quody, Hoopette, and some redshirts then head out to sea, following the whale to the site of Seaside Springslam ’77. Long story short, the whale flips Quody through the air to his death. The whale dives under the ice, presumably to its death by drowning. Hoopette waits on a ‘berg as a chopper arrives to rescue her. What went wrong? How about the starring beast? 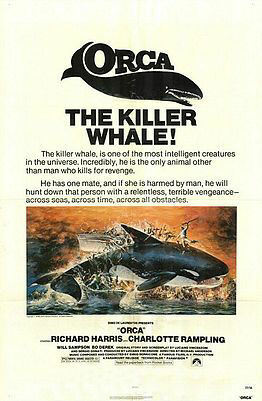 As noted, the killer whale was selected because it can potentially be seen as more dangerous than the great white. And, indeed, such whales have been known to kill great whites in real life. The problem, however, lies in the portrayal. The whale is shown as having human-level intelligence and emotions. And while humanization might seem like a good idea, it reaches levels of sheer absurdity. How does the whale know where Quody lives? How would it know when he’s on the beach in order to scream at him? How would it know the importance of fuel lines and that cutting them would hurt the village and cause the villagers to turn against Quody? I’ll stop here before I fill the page. Also, we see the creature too much. There are tons of shots of the whale swimming through an obvious pool filled with non-ocean, green-tinted water matched against an unconvincing miniature of Quody’s dockside house on a blue set that doesn’t fit the floor plan of the soundstage the actors inhabit. All the while, the whale swims like it’s playing around at Sea World with Flipper. Though, Ennio Morriconne’s Halloween-esque music says it should be plotting in a dungeon with Freddy Kreuger. Uh, tone and buildup, anyone? This film is trying way too hard while going in all the wrong directions. Contrast that with Jaws, where the shark was presented as a force of nature. It kills and eats people because that’s what it does. It doesn’t pick targets. The problems on land - the fear and devastation of the summer tourist season- are natural, believable, and very real reactions. No personal vendettas are needed. Add in the fact that we don’t see the shark very much (a move forced by problems with the mechanical shark), which makes it feel like a presence that could appear at any time or place. ‘Less is more’ is definitely preferable for this scenario. 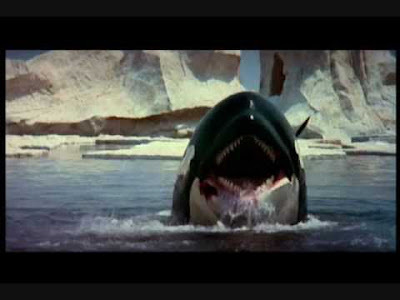 In many ways Orca desperately wants to be an art house version of Jaws. The characters philosophize endlessly about the Quody-whale feud and go back-and-forth with changing opinions every five minutes. It’s like the possible result of Joss Whedon and Vince Russo being fused into one, terrible playwright. Quody starts as a tough fisherman. After the female whale washes up on the beach, he goes cowardly and refuses to fight the surviving whale. Then, he claims he’s worried about other peoples’ safety, but after his house is destroyed and he gets berated by everyone he knows, he goes full Ahab and heads out after the animal, no matter how many die. Hoopette... um, whose side is she on? At first, she’s a classic misanthrope who admires whales more than people. She berates Quody and calls him a barbarian for killing the female whale, but then she calls him a coward for not meeting the whale’s challenge. Then she interferes with his first attempt to kill the whale with dynamite. But then, on the iceberg, she demands that he shoot the thing. On behalf of all men, I would like to say: “Make up your mind, lady!” She must only exist to point the plot in the direction the filmmakers are guessing it should go. And then there’s the crew who are loyal to Quody until the boat goes too far north and gets covered in ice like the Time Bandit during opie season. Each one decides it’s time to turn back, attempts to change the boat’s course, and gets eaten by the whale in due course. (I guess the whale won’t let common sense intervene any more than Hoopette.) The Wise Old Indian who goes with them suffers the same fate. In Jaws, we have no caricatures. Everyone acts the way we would expect them to act. The mayor, the tourists, law enforcement, etc. all make sense. We spend most of the film watching their reactions, which draws us into the story. Fortunately, they’re also distinct, memorable, and highly quotable. Plus, their personalities play perfectly into the conclusion. For instance, once the equally egotistical Quint and Hooper are out of the way, Brody - who hates the water - is left to face the shark himself. (Did any one else notice that Quint is ultimately overconfident, as Hooper implies? Or that Hooper, at the end, is a clear coward, as Quint implies?) We’re so invested in his feud with the shark and the scene itself that it’s easy to forget the tank probably wouldn’t explode like that. Who cares? Screw you, Mythbusters! This scenes rules! No such thing in Orca. This movie was a bust, for obvious reasons. However, it seems to have been a favorite of Richard Harris, who defended the film all the way to his Marcus Aurelius days. However, the bosses at Universal Studios didn’t share Harris’ affections. 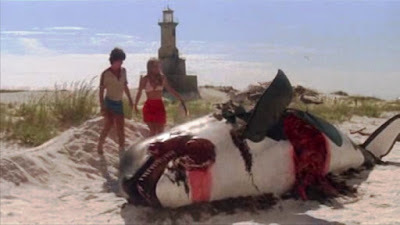 Two years later, in 1979, one of the opening scenes of Jaws 2 featured a badly mutilated killer whale carcass washed up on the beach and a scientist telling Chief Brody that there are nastier predators in the ocean. Whether this is a case of “Take that!” or a total F-U, I will let you be the judge. Rustbelt, This is an awful film and I think you capture the awfulness well. This was clearly an attempt to cash in on Jaws and the director didn't understand even a tiny iota of what made Jaws so special. Icebergs? Really? The whale is stalking him on land Huh?! WTF! Ah, the wide wonderful world of Jaws ripoffs! I remember seeing a clip of the miscarriage scene on VH1's We Love the 70s and thinking, "What did I just watch?" I don't remember much of the film except the actors did the best with what they were given (no doubt Richard Harris was drunk) and man, Charlotte Rampling was hot back then! For more info about the ultimate Jaws ripoff, click here. "when the creature miscarriages on deck... Cutting his losses, and ignoring the black market bounty he could collect from Planned Parenthood"
So good, yet so bad. Anyone hear about the animated Titanic movie? Scott, I've heard of the title of that proposed movie, but not the details. Thanks for the link. The producers nixed the idea, saying it was too character-focused and not enough spectacle. Was the Lucas School of Film already in operation in the 70's? Kit, I went back and forth on that one for a while. I think I finally found The Edge. And so, it is true that you, too, have heard of the animated nightmare that is Titanic-by-celluloid. I'm sure we both learned of the legend from the same source- as well as that OTHER animated Titanic film, too. In my travels around the 'Net, I have come across another seeker of truth who dared review that horror. His report can be found here. BTW, he also discovered the Ship of Death appeared in pixelated form as well. If your soul can stomach it, you can see his additional findings here. That's correct, though the reasons are many and varied and not just because of lack of spectacle. They even fired the original director after a month of shooting. And while the film is not in the same league as the original, you'd never know this from watching it.